Welcome to the BRITISH HOME FRONT IN THE FIRST WORLD WAR. 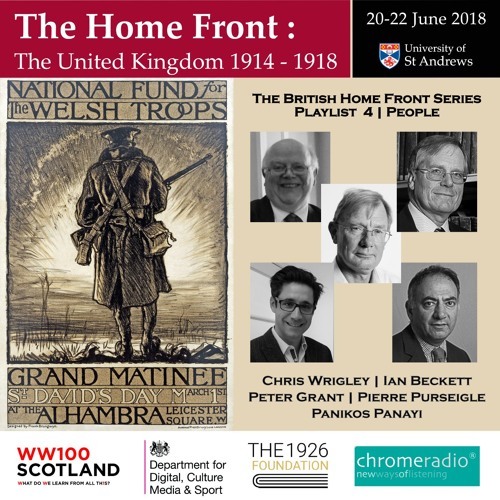 This series was recorded at the UNIVERSITY OF ST ANDREWS in June 2018 to accompany a conference marking the contribution by the peoples of the British Isles to the national war effort. PLAYLIST 4 | PEOPLE (14) PEOPLE | LABOUR AND THE TRADE UNIONS CHRIS WRIGLEY, Emeritus Professor of History, UNIVERSITY OF NOTTINGHAM, on trade unions and the rise of the Labour party during the First World War. (15) PEOPLE | ENLISTMENT & CONSCRIPTION IAN BECKETT, Emeritus Professor of Military History, UNIVERSITY OF KENT, on enlistment and conscription. (16) PEOPLE | CHARITABLE WORK DR PETER GRANT, CASS BUSINESS SCHOOL, CITY UNIVERSITY, LONDON, on charitable work during the First World War. (17) PEOPLE | REFUGEES DR PIERRE PURSEIGLE, Associate Professor of Modern History, UNIVERSITY OF WARWICK, on how the Home Front coped with the influx of refugees during the First World War. (18) PEOPLE | INTERNEES & PRISONERS-OF-WAR PANIKOS PANAYI, Professor of European History, DE MONTFORT UNIVERSITY, LEICESTER, on internees and prisoners-of-war. IMAGE | Poster for a fundraising event in support of Welsh troops - By Frank Brangwyn 1867-1956 - Library of Congress, PD-US, en.wikipedia.org/w/index.php?curid=25328628. ACKNOWLEDGEMENTS With thanks to JOHN CAWTHORN and the 1926 FOUNDATION for making this podcast series possible, and to the DEPARTMENT FOR DIGITAL, CULTURE, MEDIA AND SPORT and the SCOTTISH GOVERNMENT for supporting the Conference. PRODUCTION | ChromeRadio for the UNIVERSITY OF ST ANDREWS | Music performed by the PIPES AND DRUMS of the ROYAL SCOTS DRAGOON GUARDS | Series Editor - Professor Sir Hew Strachan | Producer - Catriona Oliphant | Post-production - Chris Sharp.